Stuffy's II is a diner-like family business located in Longview, Washington. I joined members of the Big Eaters Club on October 13 to take on Stuffy's famous 6-pound cinnamon roll. Because obviously, we love to eat huge portions for fun. Bud and Glenda Duling are the friendly owners, and Rosie is the manager. This is their second, larger location (the space used to be an Elmer's). FYI, the original Stuffy's location no longer exists. The Dulings have always had gigantic portions on the menu in the near-25 years Stuffy's has been open. They already have three different food challenges, each weighing anywhere from five to seven pounds. 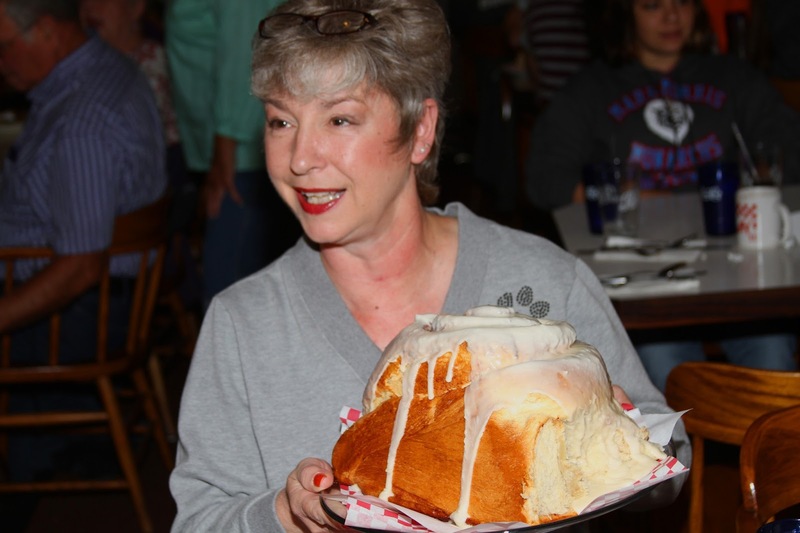 There's a 5-pound burger challenge (that should be ordered well in advance), the "Large Stuff" (a scramble of hash browns, eggs, meat, veggies, and tons of country gravy), and a 12-egg omelet with a bunch of hash browns and four pieces of toast. On those three challenges, there have been a bunch of winners, all on their "Stuffed Wall of Fame." You can see the photos as you walk in this place. 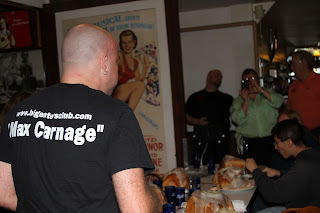 I don't think challenge winners get the meal free, but they do get a hat or T-shirt. But this Big Eaters gathering was all about the famous ginormous cinnamon roll profiled on Food Network's "Outrageous Foods." Yeah, it's the same cinnamon roll that tables of four high school football players couldn't finish. Based on the pictures, it didn't look too daunting, so I figured maybe there's a shot here. And then I walked into Stuffy's and saw the King Kong-sized cinnamon roll from 30 feet away. NOPE, the panda wasn't gonna beat this beast! We prodded it, measured it, and photographed it like we were conducting some type of alien study. It's advertised as four pounds, but the ones we had got up to SIX pounds and were all virtually equal in size. About eight inches in diameter, seven inches tall, and weighing a legit six pounds. All we needed was Wilford Brimley saying "diabetes" behind us with each bite. We all convinced the owners to make this Stuffy's fourth official food challenge. One person, one 6-pound roll. As of right now, no time limit, just keep it all down. Eating 5.5 pounds is very impressive! Ryan (background) is definitely feeling the sugar and carbs! For the record, this was easily one of the best cinnamon rolls I've ever had, and definitely the best when factoring in the Godzilla-size portion. These had just come out of the oven not too long prior, the icing on top still oozing down the sides. The outside had a hard crust-like feel, but the inside stayed amazingly soft. Not too far removed from cutting into a freshly baked homemade loaf of bread. I smartly stopped after eating three pounds of cinnamon roll. I wasn't full; I just wanted to avoid the food coma and severe sugar crash. I decided to share my leftovers with the managers at my apartment. Even they couldn't believe that I brought home HALF a cinnamon roll. Isn't it awesome we're using a Weight Watchers scale?! Three things ultimately sold me on this cinnamon roll. First, the inside was still warm, and inside the crater-like cinnamon roll, the thick cinnamon-brown sugar combo either clung to the layer of dough or flowed out like chocolate in a lava cake. Second, this monstrosity was only about $9. Seriously?!?! Ridiculously cheap, to say the least. Easily the best deal on a cinnamon roll you'd ever find. Third, if you come on your birthday and order any entree, you get this massive 6 lb. cinnamon roll for FREE. Yes, FREE. I know where I'm headed next year. And your cinnamon roll leftovers get their own CAKE BOX! Yes! I also had some coffee here. To me, it was just a standard cup o' Joe here, nothing really to write home about. But I'll say that it helped fend off the sugar crash and got me home safely! Honestly, the "stuff" (homemade hashbrowns, ham, cheese, onions, peppers, tomatoes, and country gravy) sounds amazing. But the "hot stuff" -- with salsa and sour cream instead of gravy -- sounds even better. They even have a "taco stuff" with taco meat and a "fajita stuff" with salsa and sour cream (instead of gravy) and steak chunks (instead of ham). I want to return for a more "normal, sensible" meal. You know, the kind that won't necessarily give you a food coma or diabetes. Then again, I'm not too sure on what the real meaning of "normal" or "sensible" is. My stomach probably loves me and hates me all at the same time. Such a confused organ. 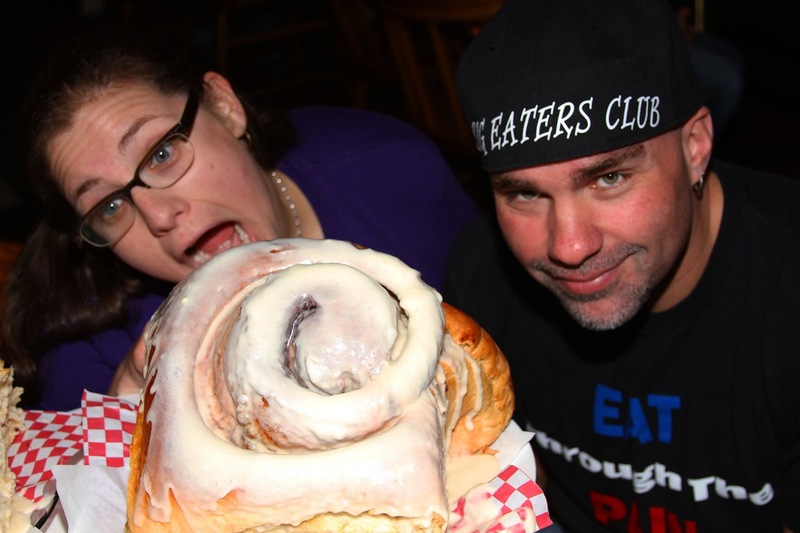 Finally, Stephen Garretson (GEE-Photo.com) took professional photos of the Big Eaters Club cinnamon roll festivities. Here are some of them. Thanks, Stephen! And Stephen also edited a great video! Check that out as well! 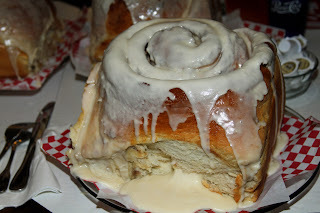 Ermagawd...that's a gigantic damned cinnamon roll.